Our early morning run today was much colder than I reckoned on. There was a brisk wind blowing through the empty fields, and the leafless trees did little to stop its frigid breath. Still, the outing was enjoyable for other reasons. The land has not reawakened yet, so it was very quiet and absent of wild or human life. There was a golden hue to everything that was stunning. The dog’s coats blended into the landscape perfectly. With no snow to trudge through, the girl’s really got to stretch their legs and muscles. 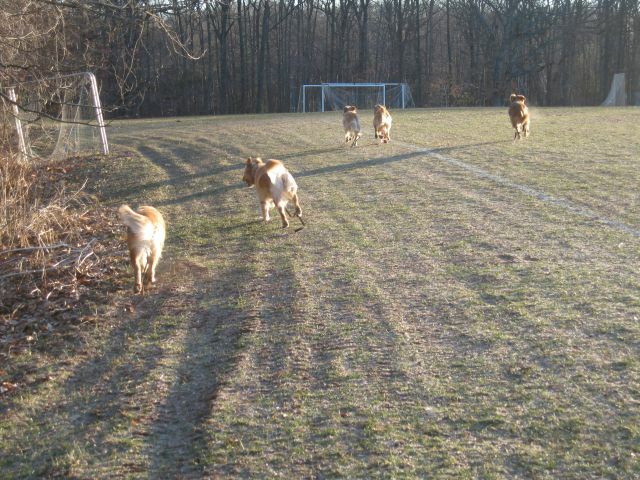 Mostly I saw only their tails as they ran far afield. Walking home cold but happy with our exercise time, I wondered when mother nature would decide to start the Spring heats of Emma and Riley. 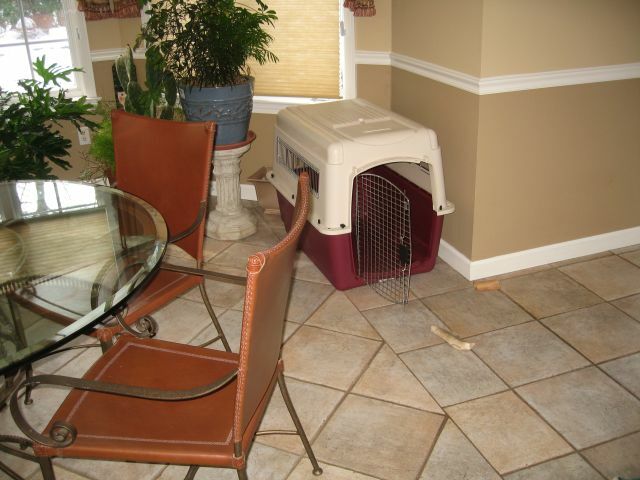 When the land starts to warm, and the flowers bloom, the pressure for a successful litter will start to build. So I enjoyed this morning with no expectations except to enjoy my canine family and the invigorating weather. 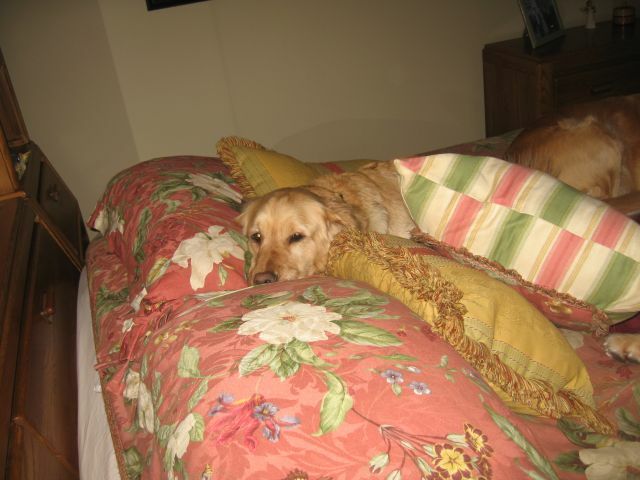 First we have Mare who sent a picture of her golden “Sierra” staying warm during a recent nap. 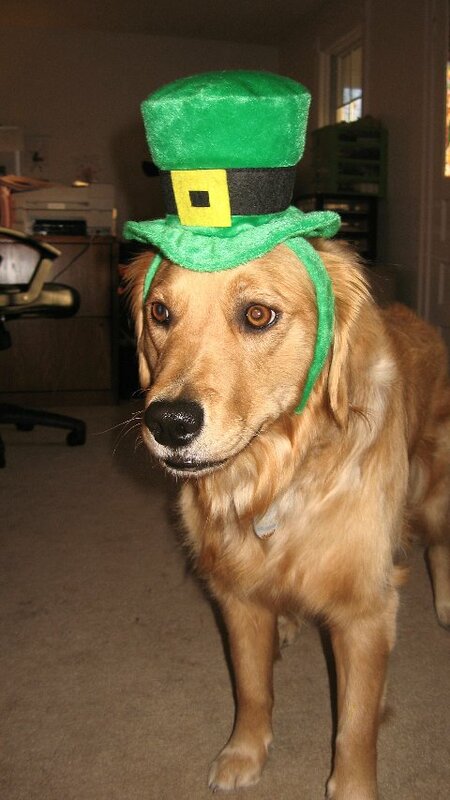 Then Cindy sent us a snapshot of “Katie” with her St. Patrick’s Day Hat. Janet takes “Logan’s” dental health very seriously as you can see. And amazingly, he returned the good turn by helping nurse Andy back to health when he had the flu this winter. 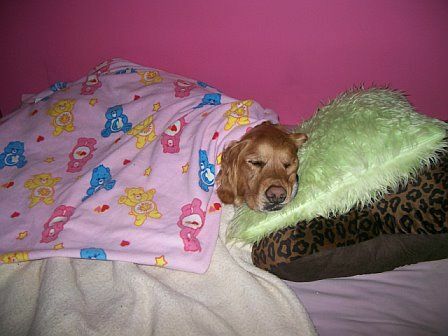 Still, I am reminded daily by some of their not so endearing behaviors, that they are still dogs and have their own inborn ideas of the world. 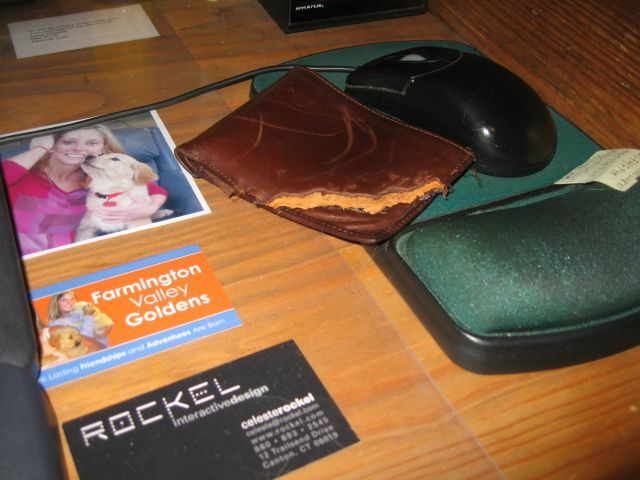 Last night I heard the sound of chewing suddenly change and looked over to see Solo had made a good start on my wallet. The credit cards had only teeth marks on one corner so I got off lucky. When I picked up a new wallet today, I also had to pick up another leather case for my cell phone. That disappeared last week down someone’s gullet and the only remaining part was the metal clasp. Never mind that these items are on a bureau that I thought was high enough to be safe. At least these items were not as costly as the eyeglasses I had to replace last year. Like the other human members of our family though, we take the good with the bad and forgive readily, because family is what our lives are all about. 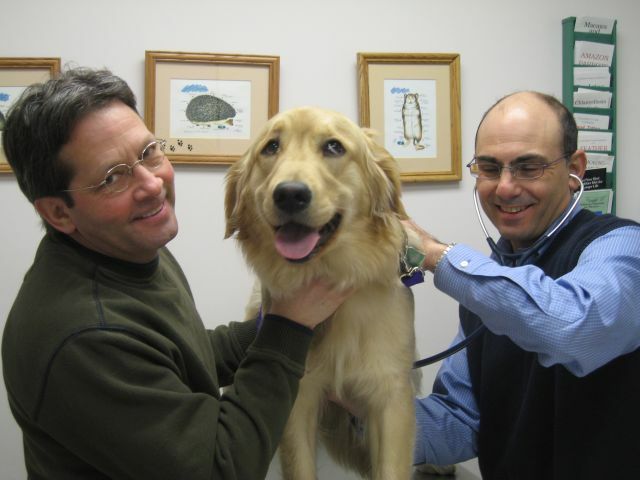 Today we had an early appointment at the Suffield Veterinary Hospital. 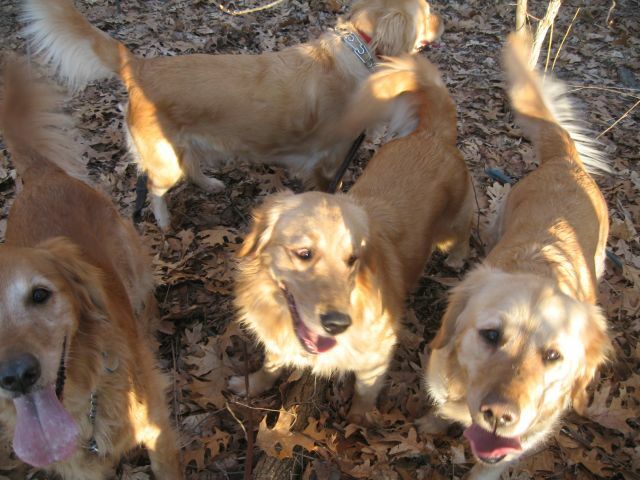 The Southern Berkshire Golden Retriever Club was having its Spring: Eye, Heart, and Microchip Clinic. 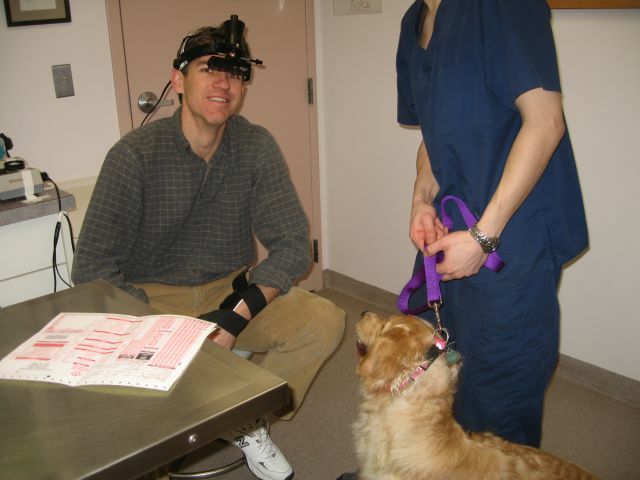 Our two breeding females Emma and Riley needed to have their eye exams updated, while Lucy was getting her eye and heart exams done for the first time. Thankfully everyone passed their tests. 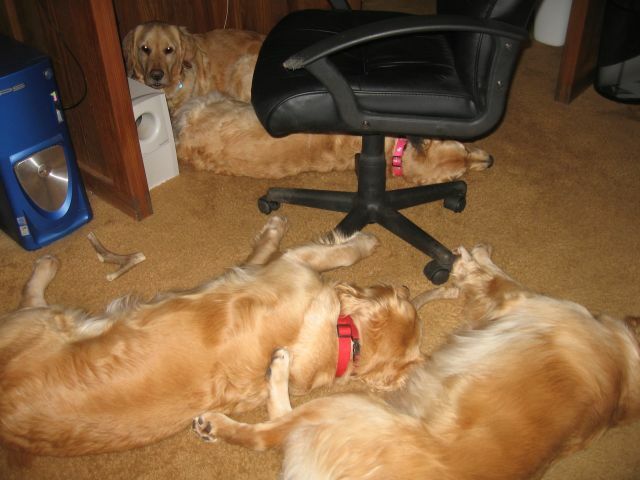 The clinic was controlled chaos as usual with multiple breeders bringing multiple goldens to be examined. I was only able to get a few photos of our Lucy getting her eyes and heart checked. We saw some beautiful animals, but taking photos of other breeder’s animals is not proper etiquette when you don’t know them. Anyway, we all came back happy as everyone passed. Now we are just awaiting the arrival of Spring and the next heats. PS: Don’t worry about Lucy with her goofy eyes in this last photo. It’s all because of the eye drops they use to dilate the pupils for an accurate exam. 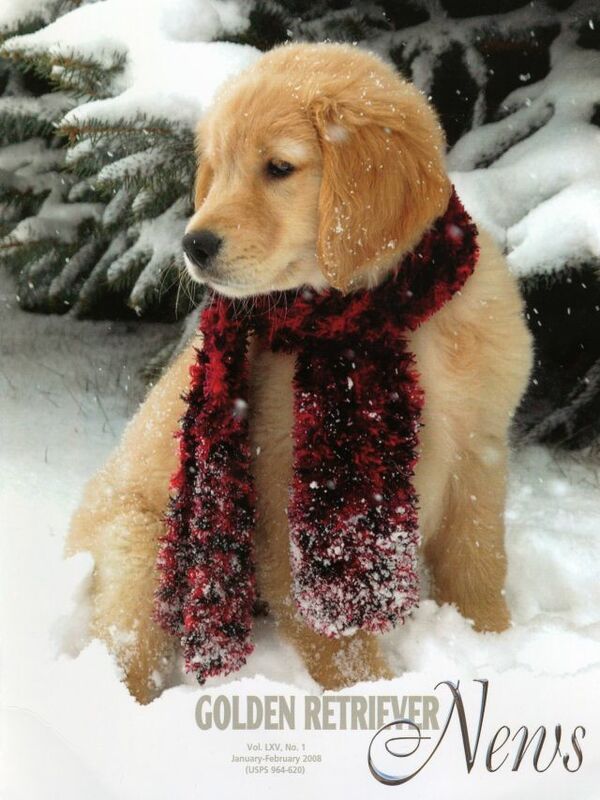 We just received the winter issue of Golden Retriever News. 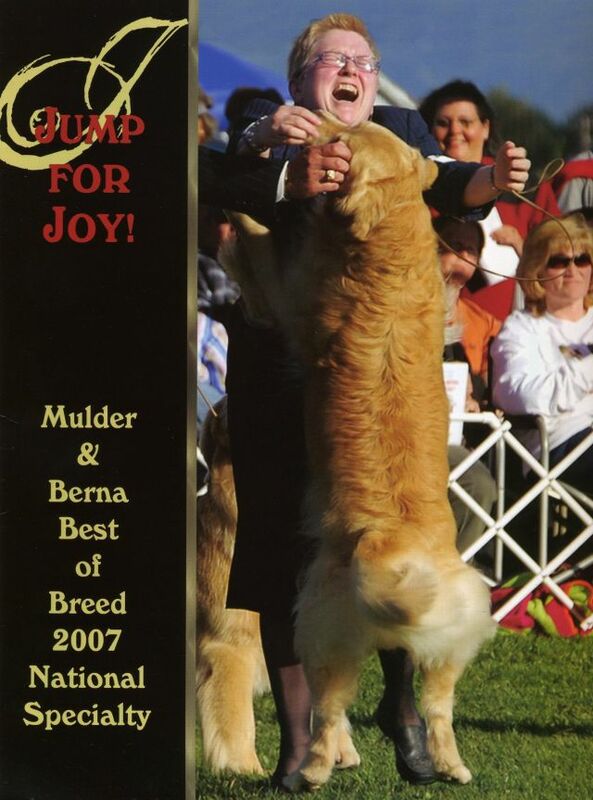 Just inside the front cover were a few more photos of Mulder and Berna with their amazing double win at the Nationals this past fall. I thought I would share these new photos with our readers. Also listed and photographed were all the winners in the many other competition categories. Magnificent animals all. 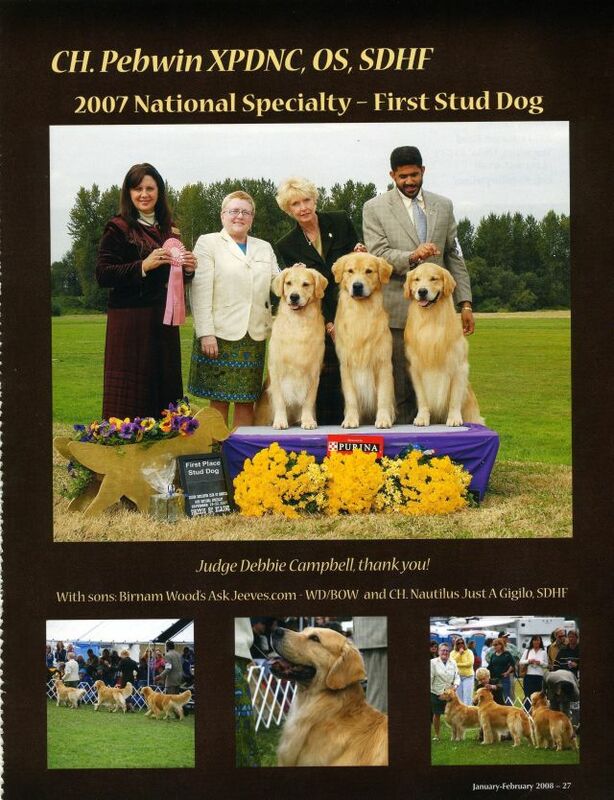 I would again encourage true enthusiasts of our breed to get a membership to the Golden Retriever Club of America which automatically qualifies you for a subscription to this National magazine. There was one more photo included which spoke eloquently of Mulder’s wholesome and humble spirit. 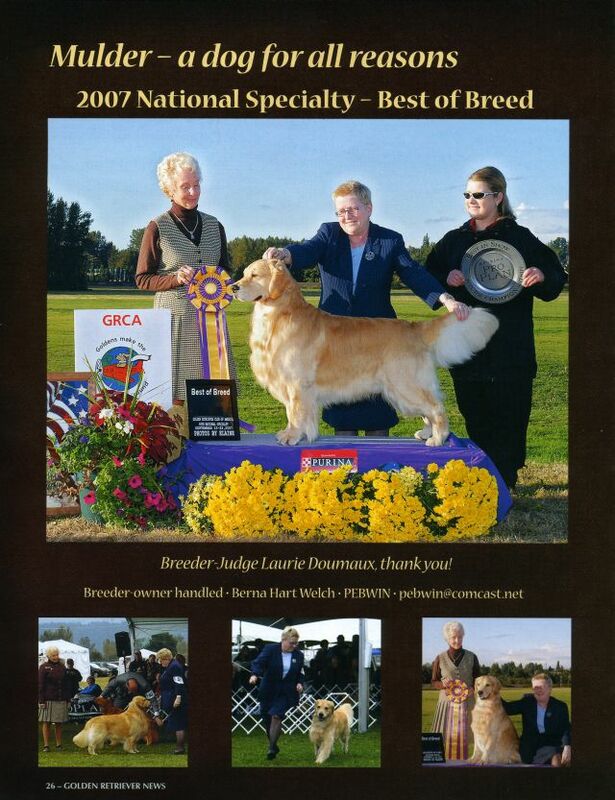 Despite the severe demands of travel and the show ring, he remains just one happy fun loving dog. We are very proud of our own Emma’s last litter when she was bred to Mulder. Dynamite personalities and Hollywood looks one and all. 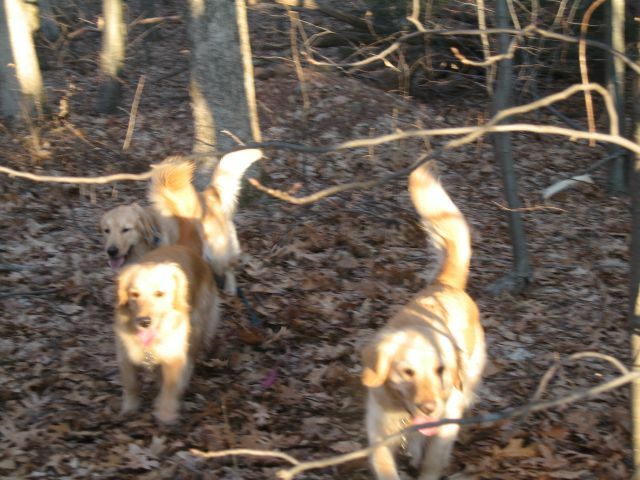 My cousin Ron and our neighbor Ken last week sent us updated photos of two of Mulder’s daughters from this last litter. 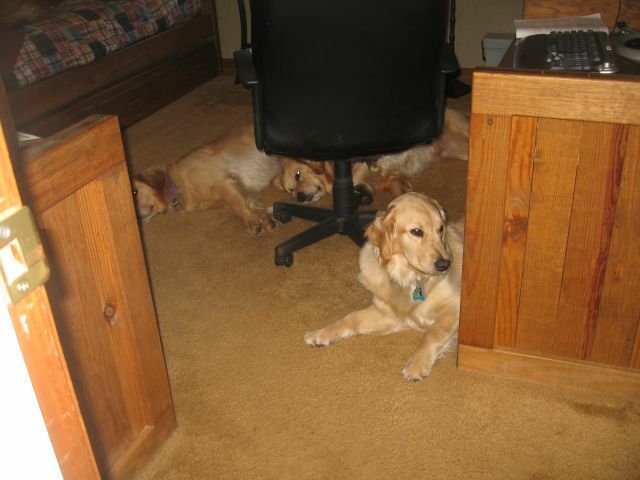 The third female in this litter was our own Lucy. They are approaching 15 months old now. 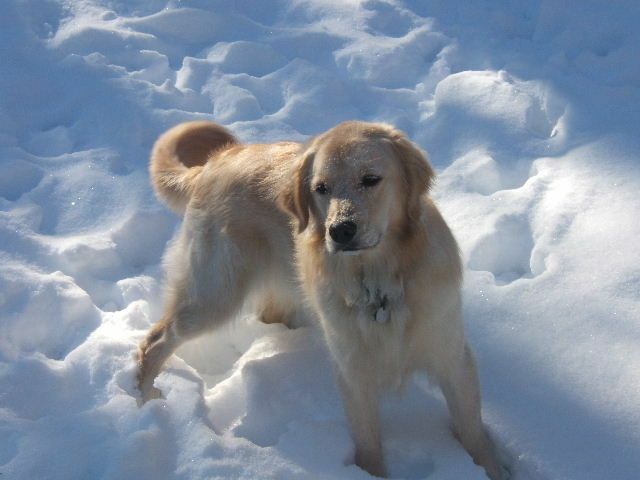 And Ken and Mary Ann’s “Rosie”..
As we expect to use Mulder for both Riley’s and Emma’s upcoming heats this Spring, we have high hopes for more puppies blessed in looks and spirit. While searching for something in “My Documents” file, I came across a folder that I hadn’t peeked into for years. This folder contained an internet poem, author unknown, that someone had sent me back in 2000. Back then I had changed it, added some verses, and sent it out to our clients who were on our email puppy list. I thought to revise it again and add some recent appropriate photos. 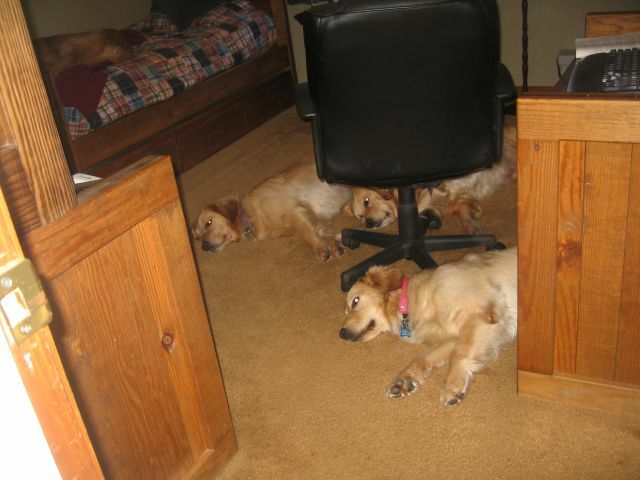 It really speaks to the mindset you develop as a breeder and member of a multiple dog household. I am not sure if we don’t become more than a little eccentric living the way we do. Our children, I’m sure, would certainly agree. 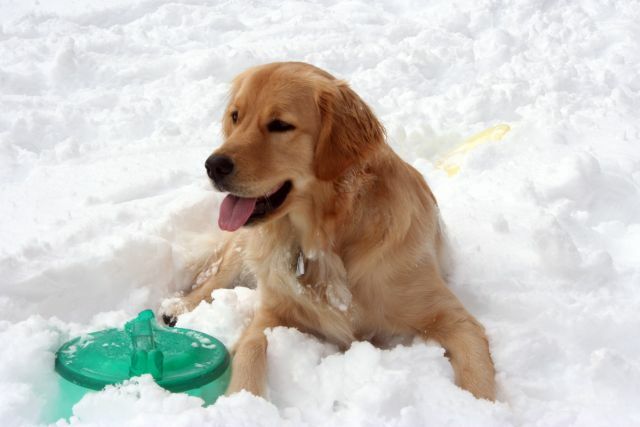 Why be cautious about owning a Golden Retriever? There’s a danger you know. You can’t own just one, for the craving will grow. There’s no doubt they’re addictive, and therein lies the danger. While living with many you’ll grow poorer and stranger. 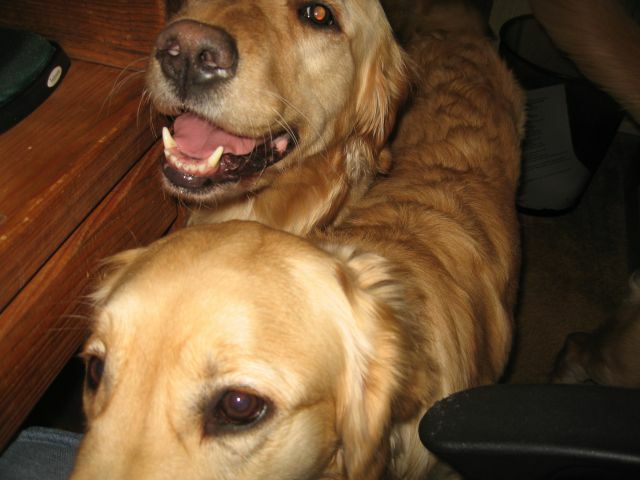 One dog is no trouble, and two are so funny. The third one is easy, the fourth one’s a honey. The fifth is delightful and the sixth one’s a breeze. 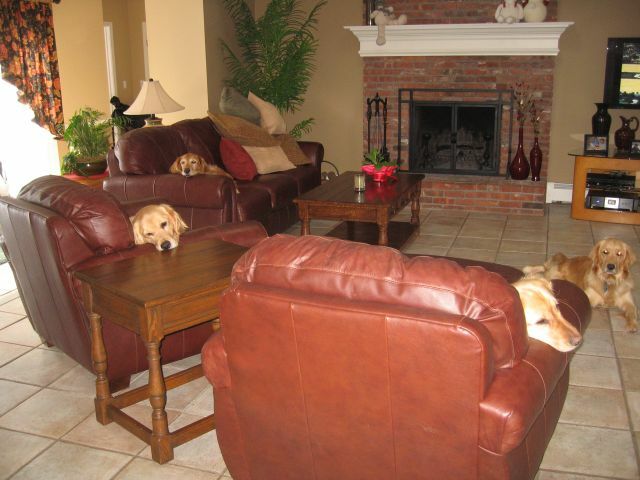 You’ll find you can live with a houseful with ease. 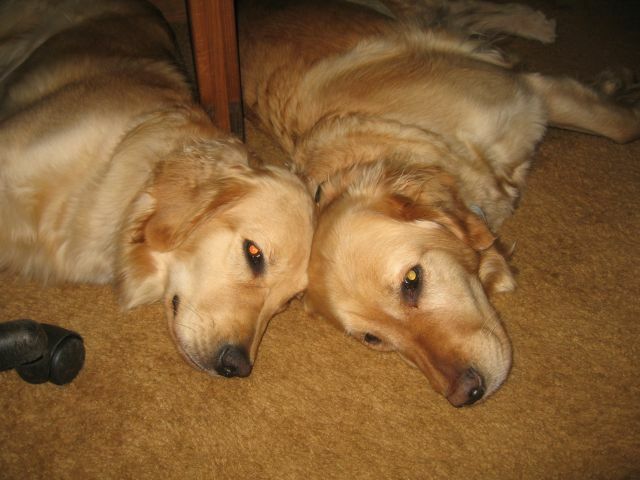 As dogs they are beautiful, smart, and oh so nice. And whatever you paid, they’re a bargain for the price. So how about another? Would you really dare? They’re really quite easy, but Oh Lord, all the hair. 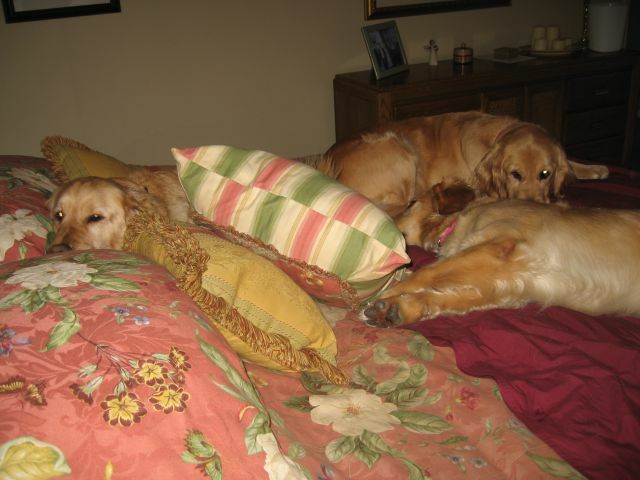 With dogs on the sofa and dogs on the bed, and crates in the kitchen, “No Bother” You’ve said. “They’re really no trouble, their manners are great. What’s just one more dog and just one more crate”. The sofa is hairy, the windows are crusty, the floor is all footprints, the furniture’s dusty. The housekeeping suffers, but what do you care? Who minds a few nose prints, and a little more hair? 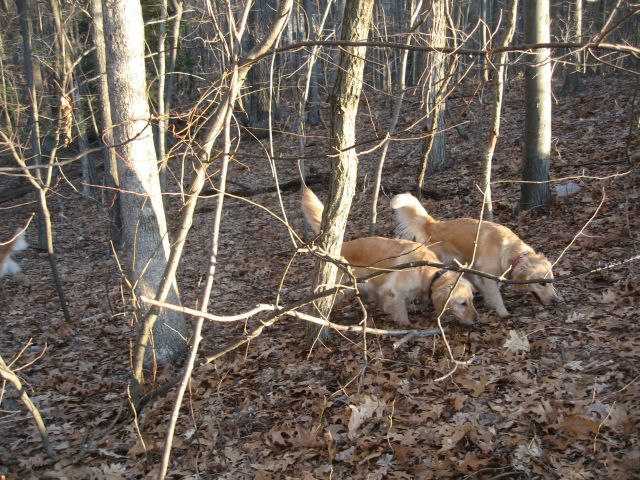 Although their colors can vary all over the chart, Goldens are blessed with the same big loyal heart. 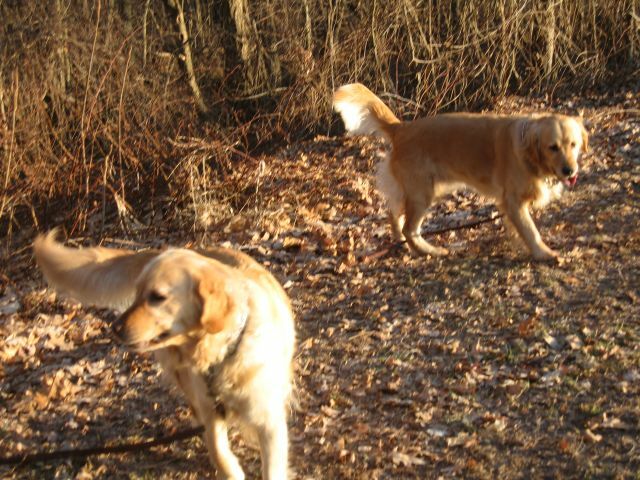 Their needs are so simple; love, companionship, a tennis ball, a stick. 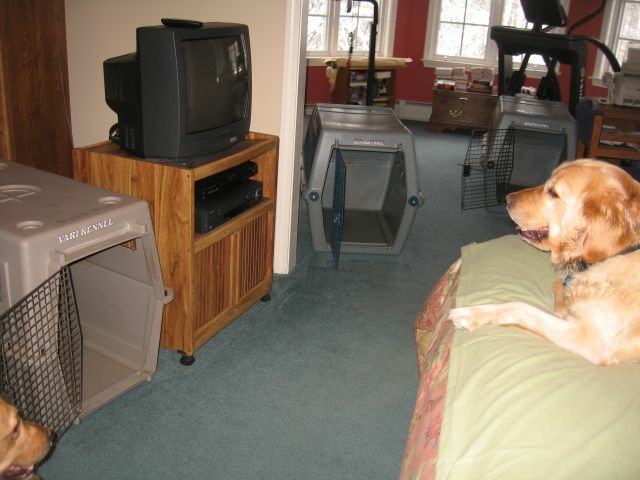 But the returns to us are immeasurable: friendship, loyalty, and from their tongues, warm licks. 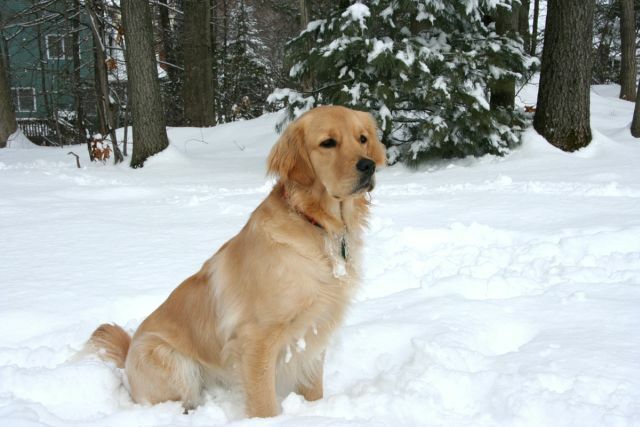 With such big brown eyes and a warm wet nose, you’ll scarcely notice all the hair covering your clothes. Who can resist such energy, playfulness, and need for cuddling. And it’s hard to be stern though their wet coat may be dripping and puddling. So no matter a tail just shattered your favorite vase on the table. One look with those innocent eyes will your anger disable. So let’s keep another puppy, you can always find room. And just add a little more time for the dust cloth and broom. 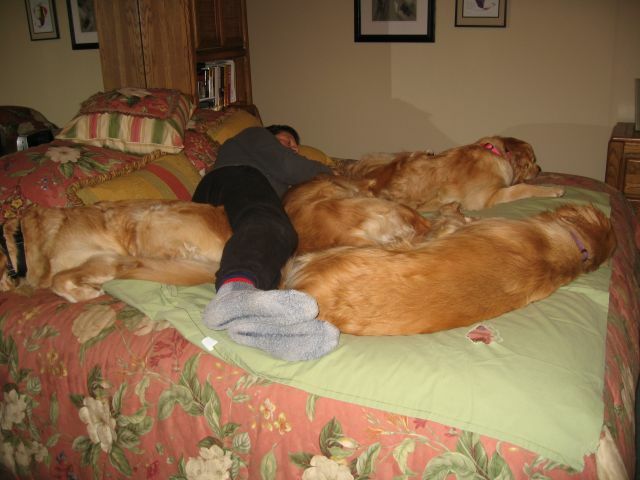 There’s hardly a limit to the Goldens you can add. And the thought of stopping makes you terribly sad. Each one is special, so cuddly, so funny. But there are big vet bills and food bills, and now you owe money. Your folks never visit, few friends come to stay. Except other dog folks who live the same way. Your lawn is full of holes and your shrubs are dead too, but your weekends are so busy: you are off with your crew. There’s dog food and vitamins and training and shots, and show entries and motels, all which cost lots. Is it worth it you wonder? Are you caught in a trap? Then your favorite golden comes and jumps up on your lap. 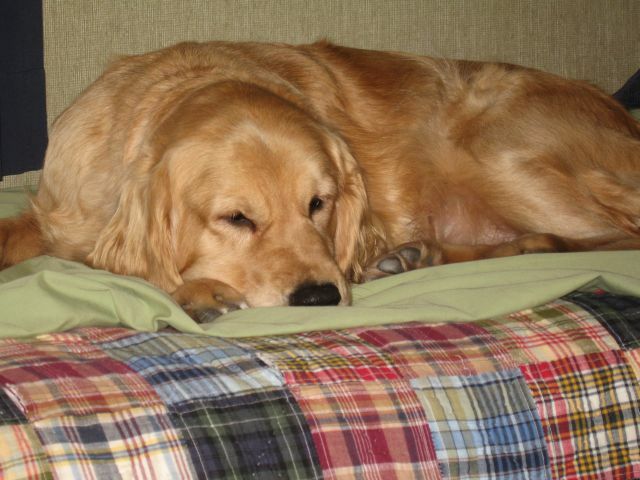 Her look says you’re special, and you know that you will, keep all of the Goldens, in spite of the bill. For life is but a short journey to be savored with pride. 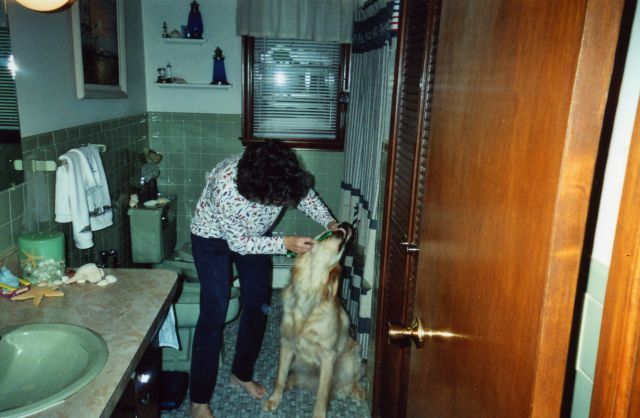 And everything is more vivid, more special, with a Golden Retriever by your side. So enjoy your old pup until word of our next litter leaks. 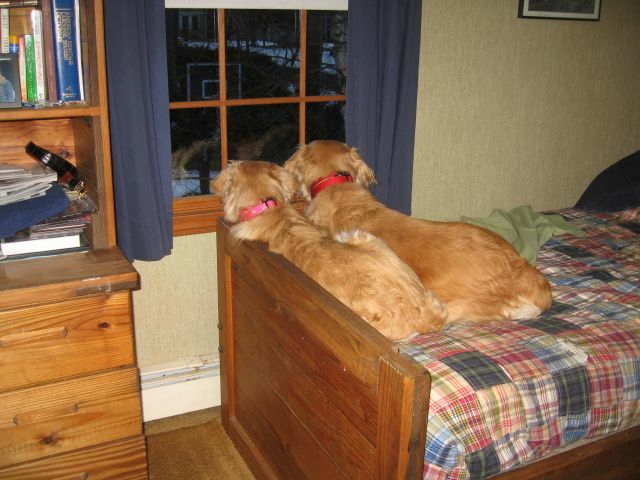 Then you will be on the phone calling, saying another golden you seek. And with my own crew gathered all around me as I take your anxious call, I will smile and be surprised.. Not at all. 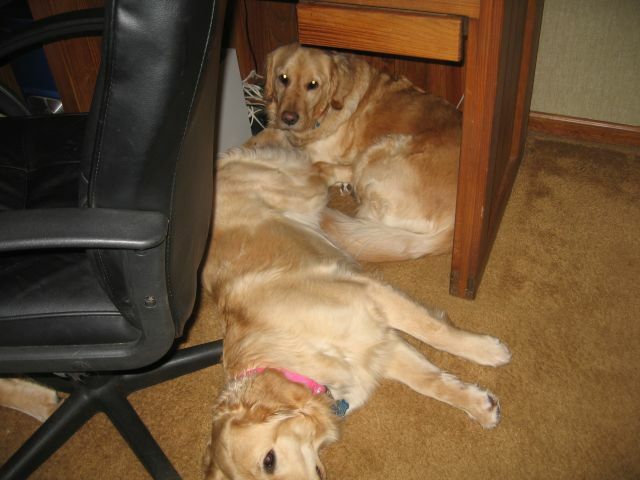 As I try to type the finishing touches of this blog, the girls are on the right and left of me. Normally I have one hand to type and mouse, while the other scratches someone’s head.